New model boasts 27 frets and a deep lower bout cutaway. The new model boasts 27 frets with a choice of a maple or ebony fingerboard, an asymmetrical body with a deep lower-bout cutaway and a five-piece maple and walnut neck with ivory colored binding across the fingerboard and headstock. Body construction is composed of a central maple section accompanied by two mahogany wings with the neck bolted directly to the maple midsection. The Horus-M3 is available in five finishes—Trans Spectrum Black and four hand-painted sponge offerings (Amethyst, Carnelian, Lapis-lazuli and Tiger’s Eye). 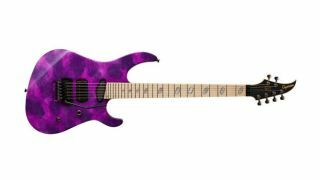 There’s also Caparison PH-R and SH27-F pickups, a matte black headstock and “Wadjet Eye” logo. The Horus-M3 is being offered for $2,669. For more information, head over to caparisonguitars.com.